There's more than a few fans in Kingston who are hoping that one of the city's hockey heroes will make a triumphant return and buy the OHL's Frontenacs. So what happens? 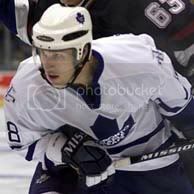 Former Leafs centre Alyn McCauley -- as first noted by fellow Out of Left Field-er Tyler King -- has joined the Queen's Golden Gaels as an assistant coach. That is very good as well. Not everyone can make the switch from player to coach. One would think the 31-year-old McCauley's own experience would give him some grounding in being able to relate concepts to players. He was a big scoring star in juniors with the Ottawa 67's -- remember that he wore No. 98 because it was "one from Gretzky and two from perfect" -- and had to adjust after he went to the NHL, because he was an undersized centre at the absolute nadir of the Dead Puck Era. McCauley and Gaels coach Brett Gibson are both from Gananoque, just east of Kingston, so there's an obvious connection. Tyler will have more on his Friday sports panel show, Offsides (4 p.m. ET, on 101.9 FM in Kingston and cfrc.ca elsewhere).